Washington, DC - Catholic Mobilizing Network (CMN), the national Catholic organization working to end the death penalty and promote restorative justice, celebrates today’s revision of the Catechism of the Catholic Church to say that, in all cases, the death penalty is “inadmissible” (Revised Catechism of the Catholic Church 2267). “Today is a capstone teaching moment for the Catholic Church. For people in the pews, it is a challenge to actively build a culture of life by abolishing the death penalty, especially in the 31 states that still have it on the books in this country,” stated Krisanne Vaillancourt Murphy, Executive Director of CMN. “In addition to papal proclamations, Catholic bishops in every state that has the death penalty have taken stands to see an end to this practice. Today’s action further clarifies any remaining ambiguity about the Church’s teaching against the death penalty and strengthens the global resolve to bring an end to this practice,” asserted Vaillancourt Murphy. This revision affirms that every person, no matter the harm they have suffered or caused, has God-given dignity. May this call from the Catholic Church invigorate efforts to end the death penalty and promote more restorative approaches to harm. 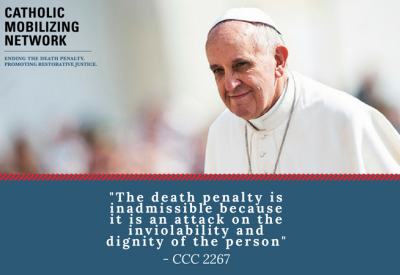 For more information about Catholic Mobilizing Network or to sign the National Catholic Pledge to End the Death Penalty (#Pledge4Mercy), please visit catholicsmobilizing.org. Catholic Mobilizing Network (CMN), working in close collaboration with United States Conference of Catholic Bishops and as a sponsored ministry of the Congregation of St. Joseph, proclaims the Church’s pro-life teaching and prepares Catholics for informed involvement in the public debate to end the death penalty and promote restorative justice.